The Chapel was originally built in the fifteenth century by the Carthusian monks of Sheen, Surrey. Previously, King's Manor - to which the chapel is attached - had been in the possession of the monks of Noyon in Normandy to whom it had been given through William the Conqueror. Henry V confiscated the property of foreign monasteries and the lands and rights of Noyon were transferred to the Prior of Sheen. Soon after coining into possession, the monks built the Chapel and adjoining Priest's House. The monks did not undertake parochial duties: but the day-to-day life of the Manor and the many occasions throughout the year of fair, feast and court. and the excitement of pillory and perhaps execution, required priest and chapel. These the monks of Sheen provided and in this wayside Chapel a condemned man could be shriven or a passer-by could use holy water. The Dissolution of the Monasteries by Henry VIII brought change. The Chapel became just a building to be used for any purpose and the priest no longer lived in the Priest's House. In the eighteenth century the building was owned by the Champ family who used the. upper part as a pigeon house and the lower part as a bakehouse and wash-house. It became known as Champ's Chapel. Later it came into the possession of the Robey family but it was derelict in 1901 when it was purchased by Mr. George Dunn, a brother of Mrs John Eyston. Mr. Dunn had work carried out to prevent further decay. The building subsequently became the property of the Eyston family and Mr. T.M. Eyston was been responsible for the Chapel's restoration. 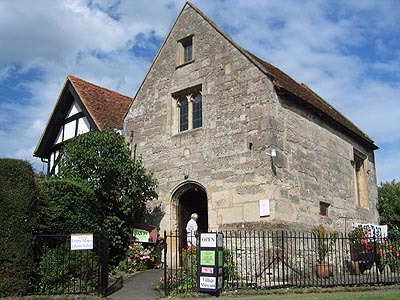 It was subsequently leased to the parish council for the benefit of the village and now to the East Hendred Heritage Trust as the local museum.